Cupertino, California: Apple Inc. said on Tuesday that chief executive Steve Jobs won’t be delivering the highly anticipated presentation that usually marks the highlight of the annual Macworld computer trade show in January. Apple also said 2009 will be its last year exhibiting at the Macworld Expo, a multi-day gathering of fans and makers of software and accessories for Macs, iPods, iPhones and other Apple products. The expo is organized by the IDG technology media group. Last year, that “thing" was the ultra-thin MacBook Air laptop; in 2007, Jobs gave Macworld attendees the first glimpse of the iPhone. A decade earlier, as Apple was struggling financially and Jobs had just returned as CEO, he wrapped up his keynote, paused, and then added: “I almost forgot. We’re profitable." Apple said Philip Schiller, a marketing executive, will deliver the keynote instead of Jobs. The switch indicates “a shift in power going on at Apple", said Piper Jaffray analyst Gene Munster. Munster said Schiller is one of two contenders to succeed Jobs at the company’s helm; the other is chief operating officer Tim Cook. Apple said it was abandoning Macworld because the firm has other methods for getting in front of customers, including its growing chain of retail stores. Munster said it makes sense for Apple to back out because it can generate just as much buzz by hosting its own product launch events. But the analyst called that part of Apple’s announcement insignificant compared with the news that Jobs will not be delivering the keynote. “This is his baby. This is his presentation. It’s his flock," he said. Munster said he believes Jobs’ absence could mean that Apple doesn’t have a big product to unveil this year, and that Jobs refused to give a newsless talk. Or, he said, it could mean Jobs, who recovered in 2004 from a rare but treatable form of pancreatic cancer, is having health problems. 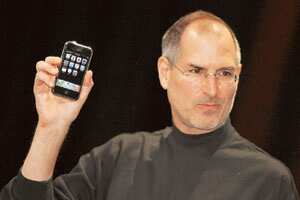 “I think that Apple could have done a lot to have made it so people wouldn’t speculate about Steve Jobs’ health," he said. Jobs has appeared very thin but energetic at Apple events this fall.